This parameter is used to define when and how to update the camera orbit angle with chase target. Reset is related to SwitchCamera(). selecting this the camera will always reset it’s angle to origin angle position related to chase target forward. SwitchCamera() will no longer trigger reset, even player change that camera angle, later when they switch back to this camera preset, the same angle will remain. No matter the camera preset is activate or deactivate, the input stream will keep update the orbit angle position for this preset, useful when developer wanted to synchronize multiple camera angle. immediately teleport to destination camera idea position. create a smooth path toward destination camera idea position. this parameter are depends on “Move Method”, smaller amount will result in slow motion, higher amount will travel to destination faster. immediately teleport to destination camera idea angle. create a smooth turn toward destination camera idea angle. have another name “SLerp”, create a smooth turn toward destination camera idea angle. save as “Lerp” but result in faster calculation, but because the value are inaccurate may create some undetectable camera shake. and wait until the real camera angle to catch up the camera idea angle. this will help to reduce the overturn and improve the input accuracy for continue input. usually happen when “position speed” are setting too slow, and player input steam frequency are setting too high, the idea angle will easier overturn. By Enable this feature, camera will actor like a child gameobject of chase target, when chase target start turn, camera will stay in the same angle related to chase target forward. 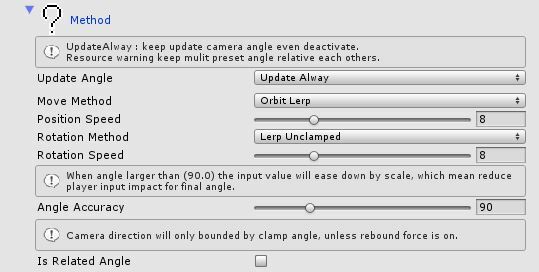 By Disable this feature, camera will not follow the chase target forward rotation, but still able to collide with “Clamp angle limit”, however if there are 360 degree, no angle limit, the camera will just stay in the same position as before.